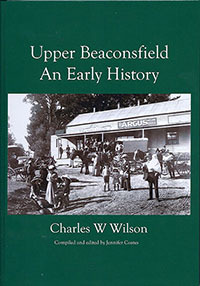 Charles Wilson wrote the brief history of Upper Beaconsfield that appears below in 2007. Following his death in 2010, a book was assembled from his extensive notes and published in February 2013. It is called “Upper Beaconsfield An early history” (ISBN 9780646594989). All the copies have been sold. Although Upper Beaconsfield is well within the boundaries of the Bunurong tribe, there is no record of any aboriginal people being seen in the hill area, and only one record, in May 1893, of an artifact being found. Unearthed during cultivation, it was described as a piece of oval shaped sandstone suitable for pounding roots. The site of the find was not recorded. In 1846 squatter John Curran selected 6,400 acres, naming it the Mt. Misery Run, the name of the scrubby range which defined its eastern boundary. On the western side its boundary was Cardinia Creek, the southern border being just below present day Guys Hill. This roughly rectangular 10 square mile run extended northwards beyond present day Upper Beaconsfield and Dewhurst. Forfeited in 1864, this land became available to selectors. Early selectors chose land suitable for grazing and cultivation, hoping to be able to provide for their family and earn some income. If the selection was to succeed good soil, easy access, fairly level ground, and an adequate water supply were all desirable. All selections were initially leased from the Crown. The excellent soil available at Berwick enticed many selectors in the late 1830s, with the result that the township was proclaimed by the Governor in 1861. Only seven kilometers away the Upper Beaconsfield area with its difficult access, poor soils, and steep terrain, had no appeal for selectors. In January 1873 not one acre of land in the area had been pegged. In 1872 significant amounts of alluvial gold were recovered in Haunted Gully, the area being recorded as the “Haunted Gully Digging.” Once legally accepted as a goldfield, Section 49 of the 1869 Land Act became applicable. Section 49 permitted any member of the public to select 20 acres (or less) of Crown Land in a gold field area. The selected allotment could then be leased for £2 per annum, and if fenced and improved, purchased from The Crown for £1 per acre. This very appealing proposition was designed by the Government to stimulate land sales and settlement around Victoria’s many old gold mine sites. The selectors who chose land in the hills had very different requirements, from the usual selectors. They were largely people with leisure time, who wished to spend their weekends and holidays away from the smoke and confines of the city, their aim being to have a nice outlook, in a pleasant and quiet rural environment. On 10th May 1873 Charles Lilburn Commins, a clerk working in the office of the Legislative Council, used “the Track to the Acclimatisation Society’s Grounds” in Gembrook, to gain access to the difficult hill area. On the high ridge of the southern escarpment, then called the Berwick Hills, he pegged 60 acres of land. Salisbury House now stands on part of his selection. Commins selected this land because of the extensive views from the ridge, and possibly hoping to profit from subdivision of this land in the future. His selection was bounded on the west by present day McBride Road and on the north by Salisbury Road. Writing to the Lands Board, Commins stated “The land being worthless and too steep to plough, I have cut down trees – ringed other trees, cleared the ground of scrub, and raked in grass seed.” He built a small slab hut on the site, which he valued at £25. Later the same year, Henry Snell, a Melbourne draper, pegged and leased 320 acres of land on the high point at the eastern end of the ridge. On the sheltered slope he built a small a wattle and daub cottage. No selections were made in 1874. In 1875 there were 7 selectors. Five of these chose the remaining high ground of the ridge line with good views. The occupations of the ridge line selectors comprised a professor of medicine, a clerk, a publican, a storekeeper and a barrister. The other two selectors in 1875 were farmers who had little interest in the outlook, but were vitally interested in a water supply. One farm, that of Johann Glismann straddled Stoney Creek, the other, selected by David Aurish, was bounded on the west by Cardinia Creek. 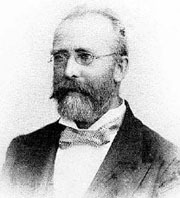 Halford, the inaugural professor of medicine at Melbourne University, was the first person to select land in 1875, using Section 49 to do so. His 20 acres filled the ridge line space between the selections of Snell and Commins, his northern boundary line is now part of Salisbury Road. Halford was an able, charismatic person as well as a respected and experienced physician. He believed the area was particularly healthy. Being well away from city smoke, high in the hills with clean air, and set in eucalyptus forests, it seemed an ideal place for a health resort. Halford expressed his views freely, they were widely known, and many people agreed with him. Having leased his land and fenced it, Halford had a very attractive weatherboard house built on the ridge. His improvements entitled him to purchase his selection for £20. This sale was completed in August 1876, Halford becoming the first person to own freehold land in the district. He became the first postmaster, with an annual allowance of £6 for his duties. The settlement then became “Beaconsfield,” a name it retained until 1891, when post office bureaucrats decided to change the name of the post office to “Beaconsfield Upper.” Most people call the town Upper Beaconsfield. In 1877, the Government, probably as a result of urging by the selectors, subdivided and surveyed local Crown Land into at least 268 twenty-acre allotments. At first these allotments were leased, later many were bought by the selector, provided welcome revenue for the Government. In April 1877, the first of these allotments were made available to the public under the provisions of Section 49 of the 1869 Land Act. The public responded very quickly. By October 1877, 150 of these allotments had been taken up, the remaining ones being selected over the following 12 months. Once selected, most allotments were fenced, fulfilling a condition of the lease, but the growth of housing was slow, increasing a little after the opening of the Melbourne to Sale train line, making daily commuting to Melbourne practical. An observer estimated in 1885 that there were about 100 good houses in the village. Today, with the exception of a few roads which have been subdivided in a suburban fashion by developers, the majority of houses in the village are on large blocks, ranging in size from 1 to 40 acres. This scattered housing helps to retain a pleasant rural atmosphere, and is a reminder of the early 20 acre subdivisions. In October 1878 Brisbane wrote to the Council stating that a meeting of selectors had been held, and a committee appointed to consult with the Council as to the necessity of forming an additional riding in the Shire. The selectors realised that without representation in Council, improvements in roads and bridges would be unlikely. Brisbane continued to press the claim for another riding, finally in August 1886, achieving his objective. Two councillors for the new Riding of Beaconsfield were elected in August 1886. Brisbane had a resounding win, receiving 50% more votes than Goff, the second councillor elected. There were six nominations for the positions. At the first Council meeting Brisbane was appointed to the Finance Committee. Both the new councillors were men of integrity, able and forceful, they made excellent representatives. During their years in Council both were elected Shire President on two occasions. When State School No. 2560 opened at Beaconsfield North in 1884, there were 22 pupils; now there are more than 350 pupils. The same year, the community hall in Salisbury Road was completed and opened for public use. Religious services were held in the hall on Sundays. For a time it was a satisfactory arrangement, until 1921 when a decision was made to build St. Johns Church. 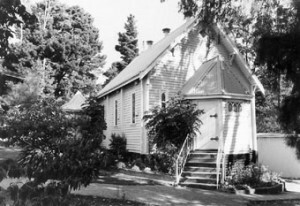 The new church, completed in 1923, was destroyed in the 1983 Ash Wednesday fires. Initially, Brisbane’s Beaconsfield House catered well for visitors, any overflow staying at one of several private homes accepting “paying guests”. As the number of visitors grew it became apparent more accommodation was needed. Enterprising Berwick carrier, George Craik, whose wife ran a successful boarding house on the hillside, present day “Guys Hill,” decided to provide this accommodation. In 1888, having bought the remaining acres of Commins ridge land, Craik built an elegant 32-roomed guest house, which he named “Kincraik.” It was an instant success. Set in 30 acres, it could accommodate 60 visitors, and was noted for its croquet lawn, the delightful views to the south, and the fern gully below it. In 1896 when the Misses Heddrick became the proprietors, they changed the name to “Salisbury House.” It continued to function as a guesthouse until 1957. In 1976, it was transformed to become a nursing home, more recently it has had significant additions making it an excellent facility. In 1912 there were six guesthouses and the Pine Grove Hotel, catering for weekend and holiday visitors; records show that in 1924 there was weekend accommodation for at least 133 visitors. The guesthouses were an important source of income for the villagers, and also for the surrounding farms supplying the meat, milk, eggs, etc. needed by the guests. Weekend guests arrived by train, and travelled up the hill in horse drawn drags or other horse drawn vehicles. Most of these vehicles were driven by members of the Shorthouse family, the largest local carriers. In 1924 the Shorthouses were persuaded to introduce motor cars for this purpose. The fares were increased, and the romance and excitement of horse transport, so enjoyable for the city visitors was lost. The number of visitors declined and following the 1929 depression, visitors were reduced to a trickle. In 1950 only four guesthouses remained, Salisbury House, Kyogle, Runnymede, and Glen Brae in Dewhurst. Guest houses have now gone but there are several excellent B & Bs in the village. The hotel was totally destroyed by a house fire in 1918. Rebuilt in brick by Ferdinando Novello, it was again destroyed in 1983, by the Ash Wednesday wild fires. Rebuilt by the Houghton family in 1984, it is now as always, a very popular meeting place. 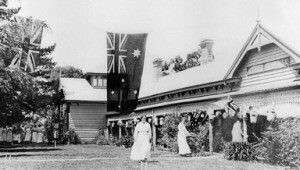 The Beaconsfield House guesthouse was built by Brisbane in 1877 on sanatorium lines, a visitor complaining in 1885, that he could find no bar. When renamed the Beaconsfield House Hotel about 1887, it must have had a license, and may have had one earlier. It continued to be the post office. On 30th May 1893 this building was destroyed by fire. The post office was moved to James Kerwin’s General Store on the corner of Salisbury and McBride Roads. Kerwin became the new post master. The post office remained as part of the store until 1914, when James Hopkins built the present Post Office, his daughter becoming the post mistress. Erected in 1920, this memorial is a reminder of the many men from the district who gave their lives in Wartime. On the north face carries the names of sixteen men who died in the 1914-1919 War. On the west face the names of six men who died in the 1939-1945 War. The first record of a general store appears in 1886. Storekeeper and postmistress, Annie Seeley owned 2 acres and built a store on the corner of present day Salisbury and McBride Roads. The store faced the war memorial. This store had a series of owners, including James Kerwin, John Garrett Marsh, Sol Halinbourg, Thomas Krüss, until it was destroyed by fire in 1920. Paul Einsiedel had another general store on the corner of A’Beckett and Salisbury Roads which was functioning in the early 1890s, but destroyed by a suspicious fire in 1895. Following the destruction of the McBride Road store, John Nathan built a replacement store in Salisbury Road, close to the hall. About 1930 Nathan built a new store in Emerald Road, on the site of the present general store. This store was destroyed in the Ash Wednesday fires. The present general store, which opened in 1984, was built on the same site as the old one. The extensive additional buildings were built in the same style as the store soon afterwards. Before cars and trucks became available good horse drawn carriers were a very important part of the economy. Everything had to be brought up the hill, passengers, building materials, liquor, mail, and food. Craik, initially based in Berwick was a significant carrier until the mid 1890s, after that the men of the Shorthouse family, with some outside help, dominated the carrying business. Alfred Shorthouse selected 20 acre allotment No.2 in April 1877. His allotment included the corner with the present day commercial centre, and extended down Emerald Road for 400 metres. On the corner site was the Shorthouse home, the booking office, livery stable, and a place for a blacksmith to work. In 1919, the Shorthouse stable held up to 40 horses, required for wagons, drags, drays, and other wheeled vehicles. The movement of the large horse-drawn carrying fleet bringing guests up the hill and then to their village destination, following the arrival of the Melbourne train on Saturday, caused a great air of excitement in the village, which was enjoyed by everyone. Following the introduction of motor cars about 1924, business declined, Shorthouse going into liquidation in 1926. Since then there have been a number of other carriers, nearly all motorised, the most important being the Harris Brothers. Over the next 30 years many successful orchards were planted, most producing a variety of very good apples, readily sold to the domestic and the overseas market. At one time there were at least 40 orchards in the area, the planted area extending from Dewhurst in the north to Beaconsfield in the south. With the outbreak of World War 2, the Apple and Pear Board took control, and continued after the war. In 1956 local prices dropped to 4 shillings a case, orchards were in trouble, and slowly declined in numbers. There are no longer any commercial orchards in Upper Beaconsfield. There was little rain in the spring of 1982, and the summer following, was dry and very hot. There were fourteen proclaimed “Total fire Ban “days between November 1982 and February 1983. Everyone in the village was aware of the high fire risk, and most had taken appropriate action. About 3 p.m. on Wednesday 16th February a fire was reported at South Belgrave. Propelled by a brisk northerly wind it moved south fairly rapidly and was soon crowning, resulting in many spot fires ahead of the main fire front. Crossing Wellington and Mountain Flat Roads, the fire continued steadily southwards through Harkaway, on the west side of Cardinia Creek. Just below Guys Hill it crossed the creek, moving to Mt. Misery, then southwards again, reaching the Princes Highway at Officer about 4.45 p.m. The fire front was only about 2 kilometers wide at its widest part but was at least 15 kilometers long, forming a linear pattern. About 9 p.m. the wind changed direction from north to southwest. Associated with this fairly sudden 90 degree wind change, there was a significant increase in wind speed. The linear fire now became a broad 15 kilometer long fire front. Moving fairly rapidly as a result of the increase in wind force, the speed of the fire was further increased by the rising ground, and the plentiful ground fuel available. The heat of the fire increased the wind velocity enormously. Near the top of the hill immediately east of the Critchley Parker Junior Reserve, it must have exceeded 100 Kilometers an hour, tearing a corrugated iron roof from the top of a building and throwing it 50 metres up the hill. Two CFA vehicles, one from Panton Hill, and one from Narre Warren, working on a track in the Parker Reserve were caught in this sudden horrible inferno. Sadly all 12 crew of these vehicles perished. Moving rapidly towards the town centre, the fire burned many buildings in its path. In the village it destroyed St. Johns Church, the general store, an adjacent shop, the service station, the kindergarten, the hotel, and the Scout Camp. In Upper Beaconsfield, 186 houses were destroyed by fire. In all 21 lives were lost, six members of the Narre Warren CFA, five from the Panton Hill CFA, a casual firefighter, and nine residents of Upper Beaconsfield. It was truly a major disaster, with horrendous losses, but the residents responded magnificently, and were well supported by the Pakenham Council and the general community. Dandenong Hospital provided equipment, surgical dressing and other supplies. City hospitals arranged for visiting specialists to help those with unusual needs. The Children’s Hospital provided very welcome help for youngsters who had suffered traumatic fire experiences. All the service clubs were very generous with both time and goods, making very welcome contributions. Rebuilding was soon under way, the community whilst saddened by their losses, slowly returned to a normal life. In similar disastrous weather conditions, such an event could occur again. The Milk Bar. This attractive building was erected in 1921 by Burton and Martin as the “Cormore” tea rooms, and a billiard room for visitors. After many owners and changes it is now a convenience store and takeaway. The Fire Station of the Upper Beaconsfield Rural Fire Brigade was commissioned and opened in December 1992. $70,000 was raised by the CFA Auxiliary and Brigade towards the cost of the building. The first Rotunda was built by the Progressive League about 1905. The League was soon disbanded, a Progress Association taking its place. In 1916 this Association commissioned the present rotunda, which was showing signs of age until recently rebuilt by the Cardinia Shire Council.